We have been arguing for the Asian bull to continue (latest posts here and here). Price action continues to be strong, but several charts are starting to look a bit stretched. Our positive view remains, but we would be dancing close to the exit door as we are starting to approach shorter term resistances. The main ETF, FXI US, trades well, but note the 200-day average approaching soon as well as the highs from late November. The big resistance is at the 44 level, so there is more room to go, but we would pay close attention to the first resistance level as well. 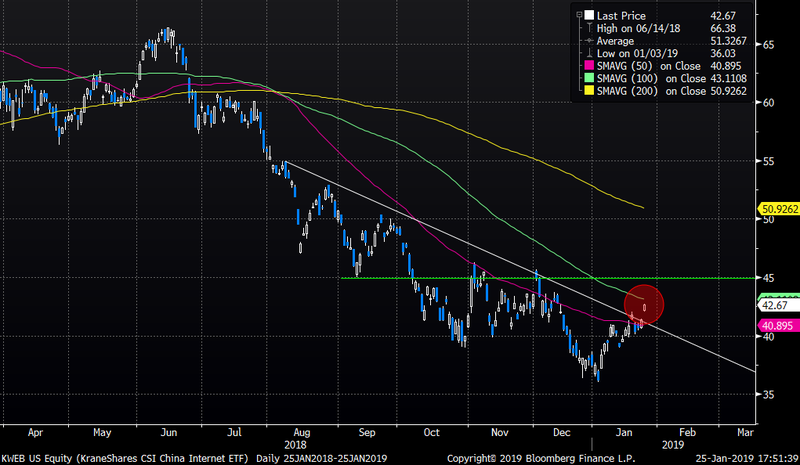 The Chinese internet ETF, KWEB US, has been a relative dog, but it is breaking above the negative short-term trend line and approaches the 100-day average. Note the big 45 resistance, still far away. Tencent, the number one sentiment stock in Asia according to us, continues trading well. The stock has been a local favourite of ours and has been the early mover for the entire tech space. 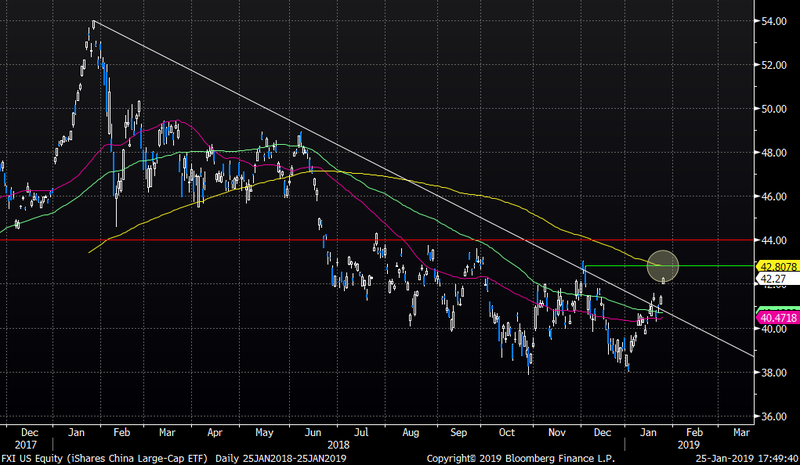 We continue to have our positive tilt towards the stock, but as we are approaching the huge 45 level, the 200-day average and the negative trend line from last year, our instincts are telling us it would be wise to start thinking about taking some chips off the table. As we have pointed out before, in order for a “proper” Chinese bull, we need people to start speculating again. 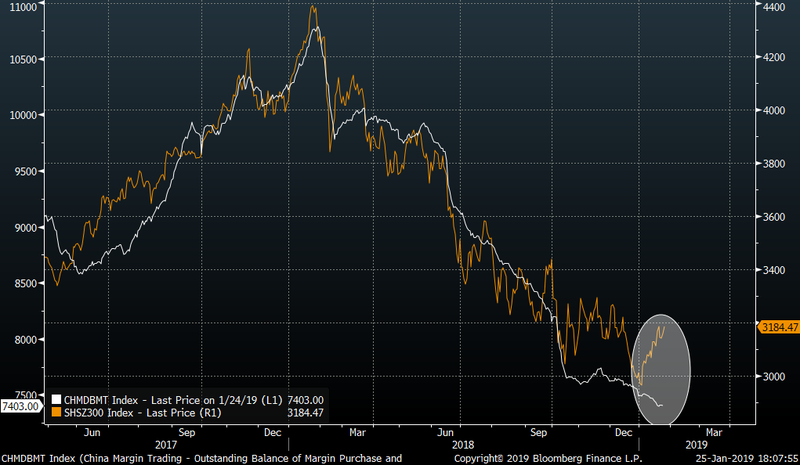 Charts shows the CSI300 (orange) versus Chinese margin trading (white). 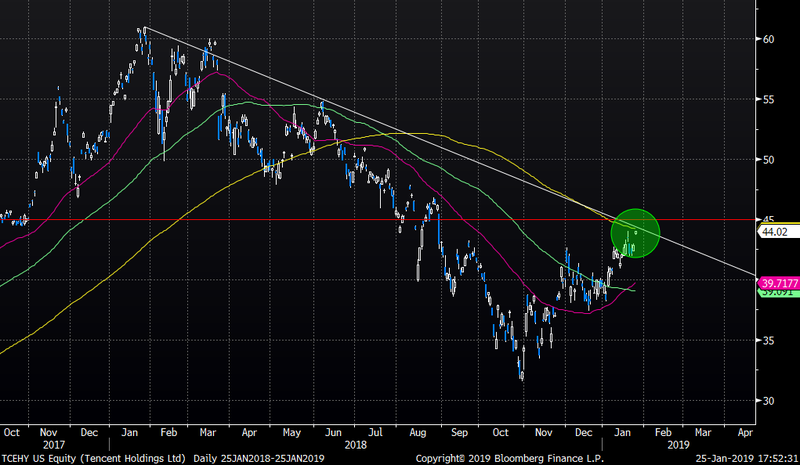 Trade deal or not, but the gap is getting a bit ahead of itself for a proper break out bull move.